My sister has been telling me about this book when I was in the States. So I downloaded it to my Kindle but I wasn't able to start on it because we were always out and about. Before I knew it, the movie version is already showing in the cinemas here. I usually don't like watching a movie before reading a book that I've been wanting to read. 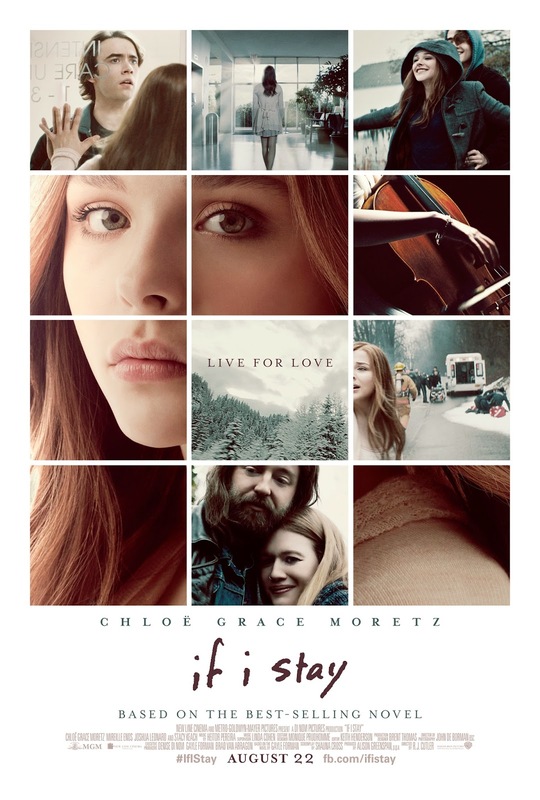 But I probably won't be able to read it any way so last week, T and I saw "If I Stay" at the Powerplant Mall in Rockwell. I was teary-eyed throughout the movie, especially during the parts about Mia's family. I never saw the trailer so I was surprised with the events that transpired (and that probably made me cry even more). Mia (Chloe Grace Moretz) is a 17-year old gifted cellist. One day, school is cancelled because of snow so she and her family head out to the farm to visit her grandparents. On the way there, they get into a car accident and the story is told with flashbacks to the past as well as references to the events that transpired after the accident. The love story between Mia and rocker Adam (Jamie Blackley) has kilig factor but what had my tear ducts going was the family aspect of the movie. I love Mia's parents, Denny (Joshua Leonard) and Kat (Mireille Enos), who used to be rockers, but went to get stable jobs as a teacher and a travel agent, respectively, so they could take care of their kids more. Another thing that got to me is how the movie centered on music. I could relate to what Mia said about playing the cello and going to another place. It's been a while since I've played the piano but I remember those times when I felt like the music was playing me and not the other way around. Our piano needs a bit of tuning and I need a LOT of practice but here's a short clip of me, taken a few months back, playing "All I Ask of You" from the Phantom of the Opera after years of not touching our piano. I played this the most before, I guess that's why I still know the song by heart. Before I end this post, I want to share my favorite scene from "If I Stay". Been wanting to watch this. Kaya lang it has been 9 months of not watching in the cinemas... So this is just one among many. Haha. Haven't had the time, or maybe will power, to leave my son and go on a date with the hubby.